Posted on October 20, 2017 by thelostlighthouse	in Comics, Literature and tagged Aaron Lopresti, art, comic book review, comic books, Conan, Conan the Barbarian, DC comics, Gail Simone, Literature, TLL, Wonder Woman, Wonder Woman/Conan. One thing I like with the versions of the characters offered by Simone is instead of the usual version of events where the current era hero is miraculously plucked from time and transported into the past we appear to have a unique take on the warrior princess in the world of Conan the Barbarian. 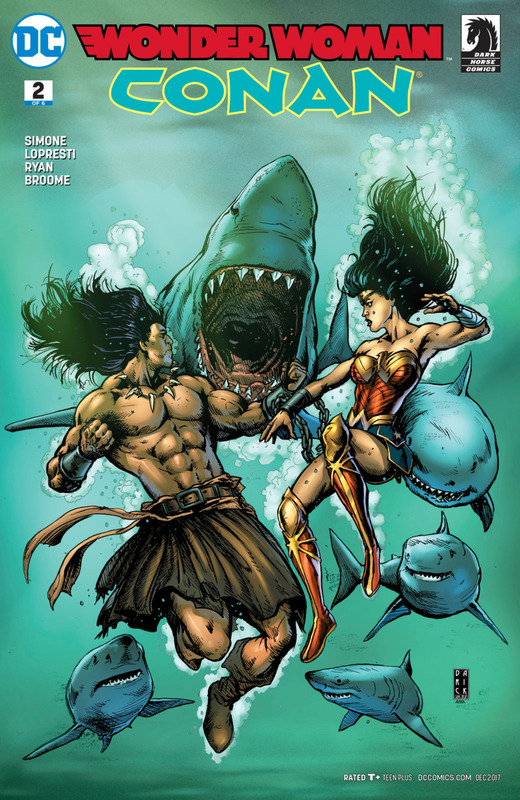 The two protagonists are still working each other out at this stage in the comic, with mystery facing Wonder Woman’s past and danger around every corner. The two have an uneasy relationship, thrown into a gladiatorial arena by the manipulations of gods to battle for the pleasure of bloodthirsty spectators. This is one of the few points I was a little disappointed by in the issue. With the likes of Batman vs Superman unfortunately haunting our memories still two heroes battling it out is feeling a little old. Don’t let that put you off though. Both Conan and Wonder Woman are fully rounded characters in this incarnation with an intriguing backstory and backstories well adapted to this version of events. Lopresti, Ryan and Broome did an excellent job on the artwork. I really like the creative borders put around the panels showing backstory and the power exuded by both warriors. A big thing for me when reading Wonder Woman is for her to feel powerful by the way she presents herself and the art team communicate that very effectively in this issue. They also have to deal with a huge cast of characters, with appearances from many side characters who have a role to play or a background to fill. Each of them is packed full of detail and character, at the standard you’d usually expect your lead characters to be at. I also really liked Temofonie’s work on the lettering, packing in a lot of dialogue to busy pages and a creative portrayal of the narrator’s lettering. However, how well do Lopresti, Ryan and Broome team up to draw hands? They look consistently great throughout the issue. They are used well to differentiate the carefree body language and attitude of the heroes as kids in the flashback, the tension in the combat or the attitudes in conversation. 9/10 for hand drawing skills! I very much enjoyed the world portrayed in this comic and the versions of the characters and their development within it. My main criticism would be some of the themes, the two heroes forced into combat right away and so on are feeling a little overly familiar now.